If you haven’t requested it already, the Tom’s of Maine sample is back. 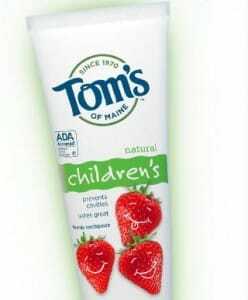 Just copy and paste email.babycenter.com/servlet/cc6?IHIPJQTWBCQDSWVNtHKpsTxnuHptGJhuVaVTRSVXLM to visit their site and fill out the short form to request your free Tom’s of Maine sample. Allow 4-6 weeks for delivery. My grandson like this so i wouuld like some for him. My kids wants to try this …!! Link didn’t work. I couldn’t find the sample request form. I also have ordered this several times and have yet to get one!! I requested this in the beginning of Oct. but never received it. The link didn’t work for me ! Would have like to get it for my grandson’s .